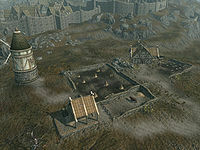 Chillfurrow Farm is a small farm just outside of Whiterun, owned by Nazeem. It is located south of Battle-Born Farm. Even though the farm is owned by Nazeem, he is actually never there. The daily maintenance of the farm is in the hands of his employee, Wilmuth, who also lives in the farmhouse. A Whiterun Guard will look after the farm around the clock, and another guard will cross the front yard several times a day. It consists of one zone, Chillfurrow Farm. 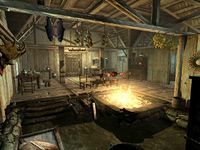 Farm owner Nazeem is reputed to be an arrogant snob among the citizens of Whiterun, but has definitely provided his employee, Wilmuth, with some luxurious surroundings. The front door opens to the sight of the traditional huge fireplace with two cooking spits and a small table with some common books. Above the fireplace hang three samples of dried frost mirriam, three garlic braids, and two fresh salmon. In the southeastern corner is a small table with two bottles of wine and a large dinner table with some food, including grilled leeks, a salmon steak, an apple pie, three tomatoes, and another bottle of wine. The northeastern corner has a food sack and a food barrel, and on top of the latter, an eidar cheese wheel and a goat cheese wheel. While the nearby cupboard contains clutter, the shelves above have a head of cabbage, a chunk of venison, and some horse meat on display. A small working desk decorates the southwestern corner, with two honey nut treats in a bowl and several books. Underneath the tabletop is an end table with clutter, on the floor, a pair of boots. A food sack is leaning against a set of shelves along the western wall with even more books. An entrance to a small storage unit can be found next to the fireplace and it contains six food sacks, a goat cheese wheel on top of a barrel, and a wardrobe with clothes. On top of the wardrobe sits a piece of dog meat and a coin purse. The bedroom contains Wilmuth's owned bed along with a handy keg and a goblet next to his pillow. The end table underneath contains clutter, the sack underneath the bed contains food, and the chest is non-respawning, unlocked, and contains leveled items. Adjacent to the bed, along the northern wall, is a dresser with clothes, with a bottle of alto wine, a coin purse, an iron sword, and a copy of the One-handed skill book The Importance of Where on top. All dressers, end tables, and cupboards in the location are non-respawning and safe to store items in. The grain mill on the property was supposed to be able to produce sacks of flour with Hearthfire installed. However, the one at Chillfurrow Farm doesn't work. This page was last modified on 12 April 2017, at 04:22.